Russia, called "the Evil Empire" by President Regan while it was the dominant force in the Soviet Union. But like every other country the people are just trying to get along. The Soviet Union broke up in 1991 and nearly a generation has gone by. As we meet the Russian people we find that they are just like us, as we have found in every country we've been in. The governments may make big statements but the people are just trying to keep the family fed and sheltered, and hopefully have something left over for Saturday night. We got up at 04:30 (or "O'dark-thirty" as we called it at work, except it wasn't dark this far north) at our friend's house, caught the first bus into Helsinki and lugged our bags the half kilometer to the train station (our friends are out of town and we are on our own). When our train arrived we climbed aboard and found our seats, it is about 5 hours to St. Petersburg. After an hour the conductor and Finnish passport control came around and we were officially checked out of Finland. Then after a stop to pick up Russian passport and customs people we were checked into Russia without a problem. Just past the town of Vyborg, Finland we crossed a large river on a high bridge and the Finland/Russia border. On the Russian side was a large cleared area (about football field size) on each bank of the river with floodlights and security cameras covering it. This is a country that is much more security conscious than any we have been in except Morocco. There is a visible difference in the countryside as we travel along. The farm buildings and small towns we pass are much poorer, the buildings and houses are mostly in a state of disrepair, but still in use. New buildings are rare but there are some. The roads are in poorer condition except for the motorways (freeways, divided highways). But there are signs of modern life too. Along the railway a fiber optic line is being laid. For many kilometers there is ditch digging and spools of cable as the line is being laid in sections, but at least some of the ditch is being dug by hand crews with shovels. In some ways it reminds us of Morocco, doing it by hand and taking days when a Cat with a cable-plow would put it underground in minutes, also the poverty of the villages and farms we passed through. They are not nearly as poor as Morocco, but they are poor by the comparable sights of the rest of Europe that we have seen. 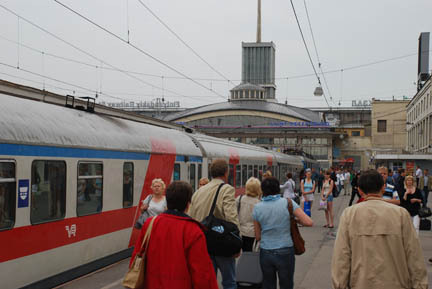 We travel for another few hours and arrive at the Finlandia station in St. Petersburg, Russia. Unlike most US cities St. Petersburg, and Moscow, have multiple train stations. The train we will take onward to Moscow leaves from the Moscow station on the other side of the Neva River. There is also a Baltic station for trains going to Estonia, Latvia, etc. You take a taxi, bus, metro or walk between them. We met our driver and he took us to the apartment that I had reserved over the internet last February. We are in Russia! Like many large cities in Europe this one is undergoing a lot of face lifting. Although some of it may still be repairs to damage from WWII most of it is just renovating a worn and weather beaten façade. Several of the buildings along the route have scaffolding covering the entire face of them, all 5-6 floors. And the scaffolding is then covered, like elsewhere in Europe, with a cloth-like material. Sometimes this huge "tarp" is printed with the façade of the building, in life-size, so that from a distance it looks like the building is there, not the scaffolding. There is a lot of money being put into improving things but it is only making a small dent in what needs to be done. Much of St. Petersburg was built in the 18th and 19th centuries and then again in the Stalin era there were huge, very plain, apartment blocks and government buildings built. We are in an older part of town but we saw some Stalin-era buildings on the way in. The sidewalks here are very wide but are in a state of wear that makes them not "handicap friendly". Altogether it is an older, but not ancient, city not unlike much of the rest of Europe. Now on to St. Petersburg.